I have to say that my memory is actually not too terrible when it comes to images, faces, and people, but when asked to remember when someone’s birthday is, I’m pretty much good as someone who just got shitfaced. Fortunately, I bought Bludso’s to my good friend’s workplace on his birthday…and I wasn’t even aware of it until he told me. My friends and I had been planning to go to Bludso’s for quite some time; we just couldn’t find a good time to do. Too late, and Bludso’s would be closed, as they had an unusually early closing time of 8 or 9 p.m. Too early, and most of us weren’t out of work just yet. There was also the lingering fear that Compton (where the original Bludso’s is), inherently, is not too safe a place. Since my time in L.A. was quickly drawing to a close, it seemed prudent as a food enthusiast to try the original, and perhaps, the best BBQ in Los Angeles, since I knew I wouldn’t be around long enough for the West Hollywood location to pop-up, so…it was Compton or bust. So, like I said, my friend and I had the idea (or just the hungries) one day to pick up a Texas Sampler order from Compton, and go full-on takeout style at his workplace out on Wilshire. We had been discussing the logistics of it, since we preferred a semi-larger group to help finish a giant heap of meat. One of my friends at UCLA wasn’t able to make it due to academic responsibilities so I decided to just pair up with my friend to battle this monstrosity. The drive from the Westside all the way to Compton and then to Downtown L.A took approximately an hour and a half. Bludso’s itself actually doesn’t have a accommodating sitting area. This was highly unfortunate, given that the people were exceptionally nice. They do manage, however, to churn out some delicious meat given their compact square footage. Carrying the monstrosity through my friend’s workplace earned us some curious eyeballing. There were two competing feelings: one of slight shame (look at these two fatties), and another of awe (look at these two champs, conquering all this MEAT). I prefer the latter. Makes me feel more Spartan-ish. 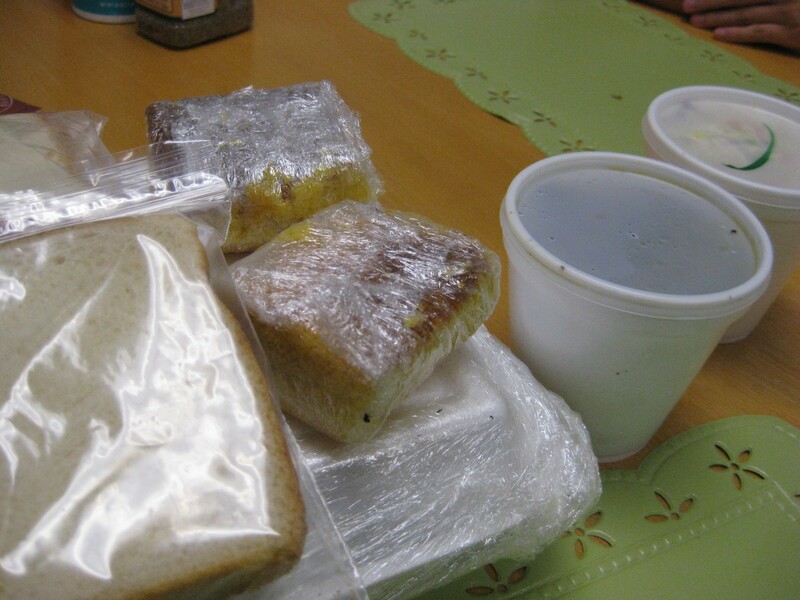 Upon breaking into the heavily Saran-wrapped container (actually a very smart maneuver for take-out efficiency), we discovered more meat that we had previously imagined, a hefty serving of coleslaw, collard greens, cornbread, and…Wonderbread. I recall my friend holding up the Wonderbread and chuckling, wondering what exactly it was for. Perhaps it was used to make our own brisket/rib/pulled pork/chicken sandwich. Hm. One of the first things that I noticed, compared to other BBQ locations in Los Angeles, was the smoke ring that was present on the meat. The smoke ring is supposedly a sign that the barbecue has been done “the proper justice.” For all the folks who are looking at me with a “WTF is this guy smokin’ look,” the smoke ring is the layer of “pinkness” found just under the “bark,” (the super black crust on the surface of the meat). In actuality, the smoke ring may not mean anything, in terms of the barbecue. The pinkness just under the bark is not an indication of “smoke penetrating the meat,” as there is, according to the musings of Steve Chatterton, “the acquisition of smoke rings without smoke, and the accomplishment of heavily smoked meats without ring development,” all of which suggest that the high-held smoke ring was perhaps just the made up mantra of a BBQ circle jerk. Good view of the smoke ring. The smoke ring can still be explained by some chemical reactions. Meat has blood cells called myoglobin. 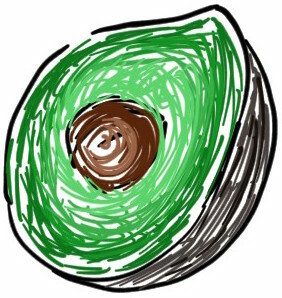 Depending on its oxidation state, they can be red, maroon, brown (which is why meat looks different at different stages of oxygen exposure). When we barbecue, the wood chips we use contain nitrogen, and the air contains oxygen (oh-two). Nitrogen and oxygen react together, and create nitrogen dioxide (en-oh-two), which is water soluble. 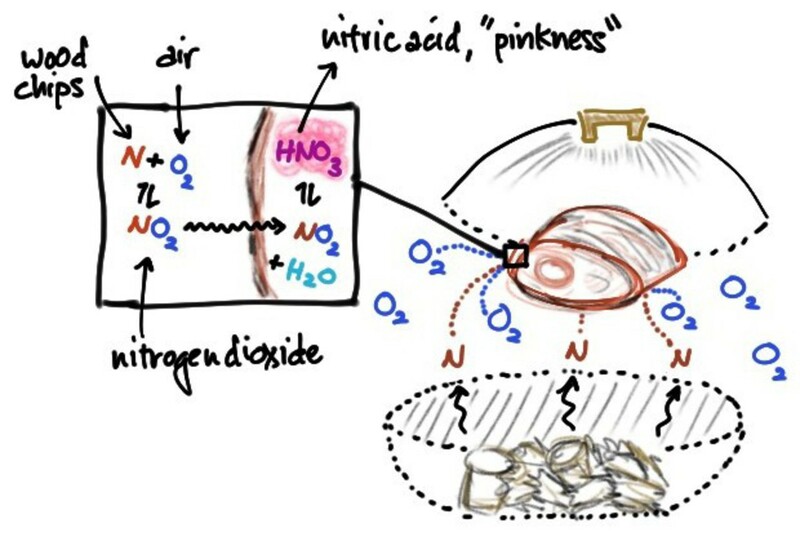 Meat contains water, and subsequently uptakes nitrogen dioxide, where it reacts with water to create nitric acid (en-oh-three), which is the major contributor to the pinkness. You could say that the “smoke ring” is a product of a reaction with the reactants being air and a source of nitrogen, the intermediate product nitrogen dioxide, and the end product, nitric acid. Smoke actually isn’t…“absorbed,” actual smoke particles end up on the bark, which is why it’s black. Here’s a reference. This chemical reaction is dependent on the specific type of smoke used, and the specific cut of meat. This process can further be affected by meat moisture content, temperature of the barbecuing process, the types of wood chips used, and ion concentrations inside and outside the meat (salt concentration). It’s complicated business. You can even get a smoke ring using natural gas or propane. 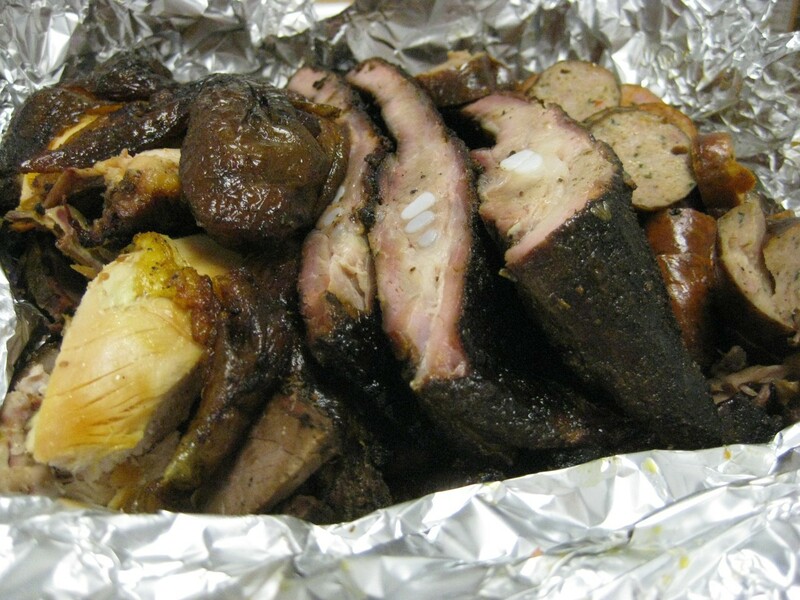 When it comes to barbecue the best results always vary. Low n’ slow, hickory chips, mesquite chips, high heat, then low n’ slow, low n’ slow, then high heat, vinegary BBQ sauces, sweet BBQ sauces, dry rubs, cold smoking, hot smoking, custom-made smoke displacement machines, liquid smoke, vertical cuts, horizontal cuts…the combinations and tweaks are endless. To me, nothing fancy is required. Some legit meat, salt, pepper, cooked low n’ slow over some wonderful unidentified wood-chips is great. Add some friends and some aged scotch…perfect! 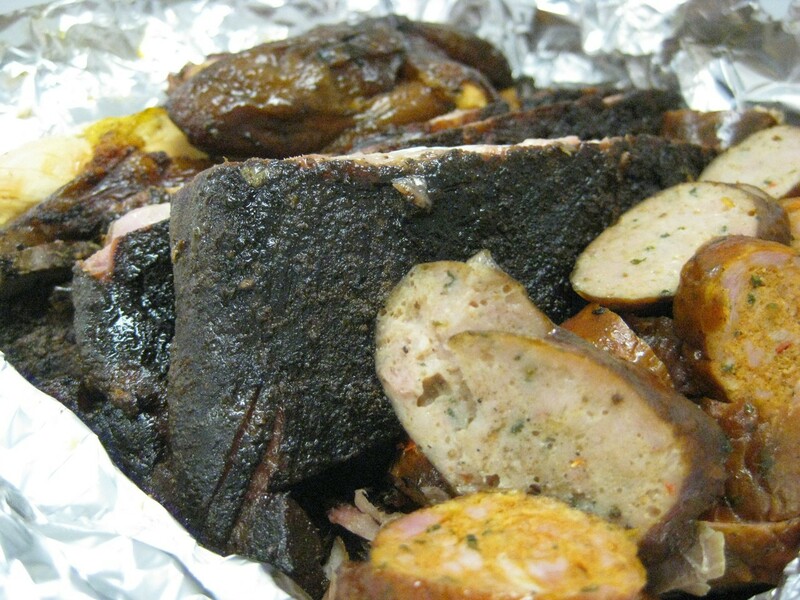 Smoke ring or not, taste the damn barbecue before judging it.